Free Document Shredding & Electronics Recycling Event! 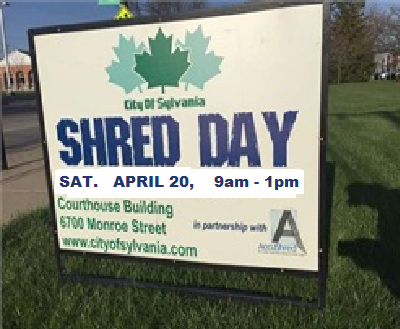 The City of Sylvania, invites Sylvania City residents and small businesses to protect your identity with the City of Sylvania’s annual document shredding event. If you don’t need it, dispose of it safely and securely. First 50# will be shredded for free, approximately 3 bankers boxes or 3 medium bags. NO BINDERS or BINDER CLIPS Please. See the website for additional details.